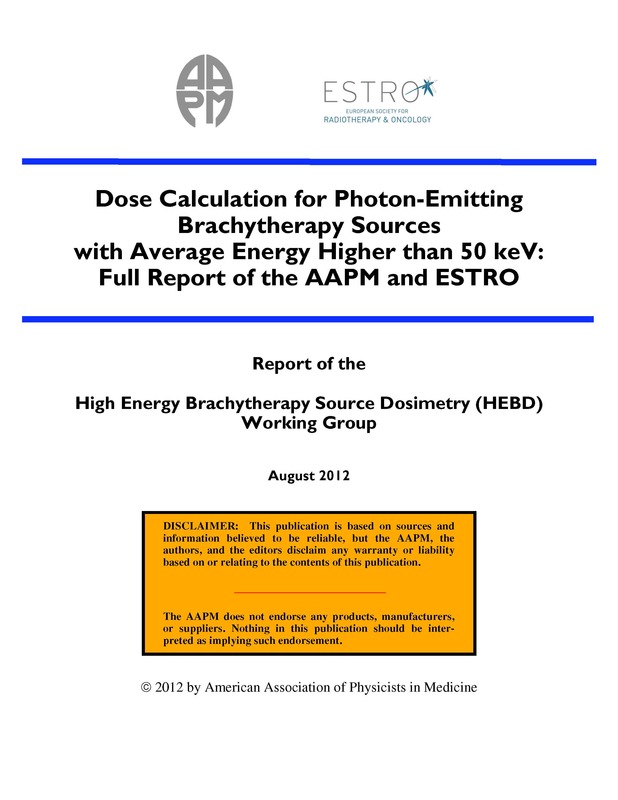 Purpose: Recommendations of the American Association of Physicists in Medicine (AAPM) and the European Society for Radiotherapy and Oncology (ESTRO) on dose calculations for high-energy (average energy higher than 50 keV) photon-emitting brachytherapy sources are presented, including the physical characteristics of specific 192Ir, 137Cs, and 60Co source models. Methods: This report has been prepared by the High Energy Brachytherapy Source Dosimetry (HEBD) Working Group. This report includes considerations in the application of the TG-43U1 formalism to high-energy photon-emitting sources with particular attention to phantom size effects, interpolation accuracy dependence on dose calculation grid size, and dosimetry parameter dependence on source active length. Results: Consensus datasets for commercially available high-energy photon sources are provided, along with recommended methods for evaluating these datasets. Recommendations on dosimetry characterization methods, mainly using experimental procedures and Monte Carlo, are established and discussed. Also included are methodological recommendations on detector choice, detector energy response characterization and phantom materials, and measurement specification methodology. Uncertainty analyses are discussed and recommendations for high-energy sources without consensus datasets are given. Conclusions: Recommended consensus datasets for high-energy sources have been derived for sources that were commercially available as of January 2010. Data are presented according to the AAPM TG-43U1 formalism, with modified interpolation and extrapolation techniques of the AAPM TG-43U1S1 report for the 2D anisotropy function and radial dose function.